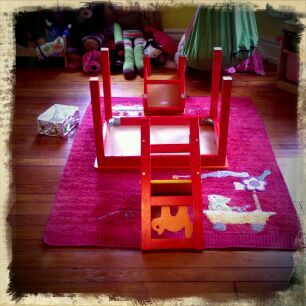 It all started when Josie came home from school this week and insisted that we make a leprechaun trap. It didn't take long for her to cover a shoe box in foil and stickers. She propped it up with a stick and there it sat for a couple of days. We didn't really have any plans for making a day out of it, but it just sort of happened. 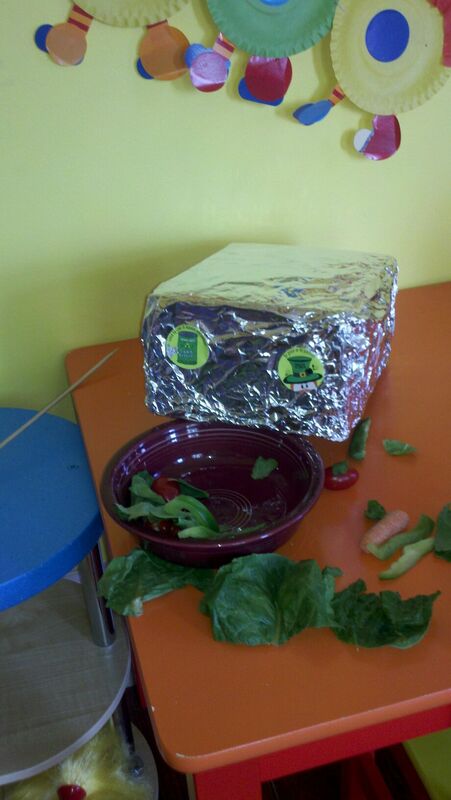 When I asked Josie what she thought we needed to include in the trap to snag us a leprechaun, she quickly determined that salad would be the best bait...you know, cuz it's green and leprechauns love green things. Lou & Josie made a salad and we sort of forgot about it. On Saturday morning, St. Patrick's Day, Josie remembered pretty early in the morning and ran to check the trap. There is sat, exactly the way she had left it. She was a little disappointed. I assured her the leprechaun probably just didn't want salad for breakfast, but would be back later in the day - maybe for lunch. Wouldn't you know - when we checked back a few hours later, that leprechaun had made a mess of her salad, but didn't get caught. Not surprisingly, the little guy headed for our brownies for dessert. When Lou went for a brownie, he found leprechaun footprints! That sneaky thing did a jig - right on our brownies! And barefoot! 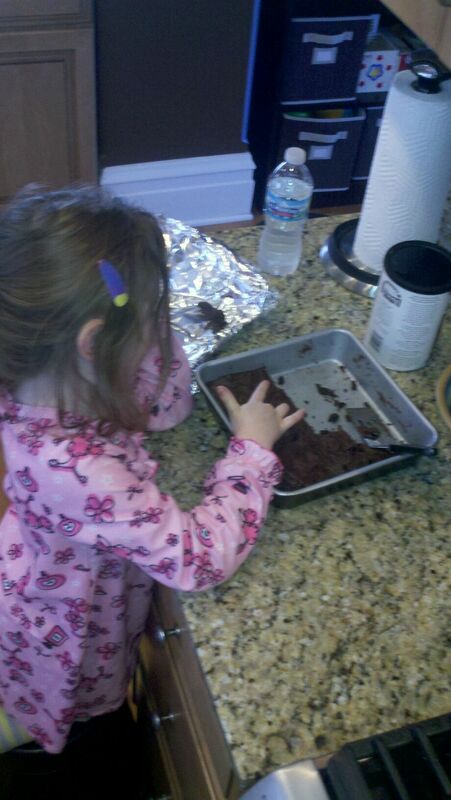 At first, Josie cried because she thought we would have to throw the brownies away. Here she is surveying the damage. 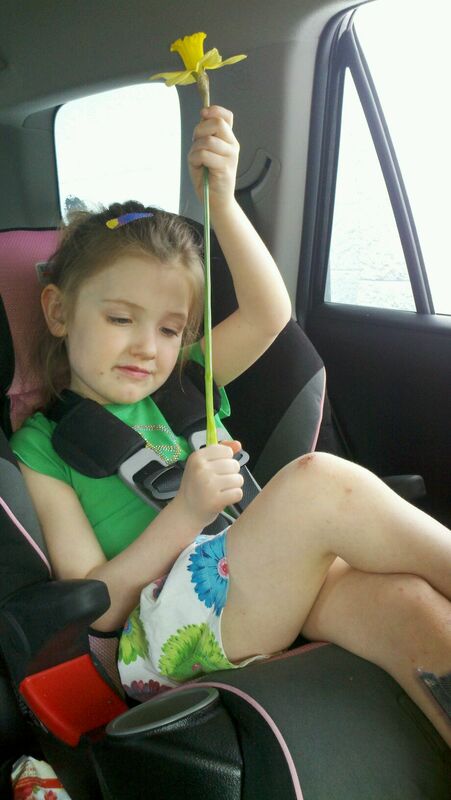 Once we told her leprechaun feet are really clean and she could still eat them, it was all back to fun & games again. Later in the afternoon, we headed to McDonald's for our Schneider family Shamrock Shake tradition - three years running! Josie wanted to take a daffodil from the yard to trade for her shake. The sweet guy in the drive-thru was very appreciative of her gesture. It was so cute, she made us roll down her window so she could hand it to him. Then she said "Happy St. Patrick's Day" with the same enthusiasm that you'd say "Merry Christmas" and hand over a giant gift. So sweet this girl of ours! 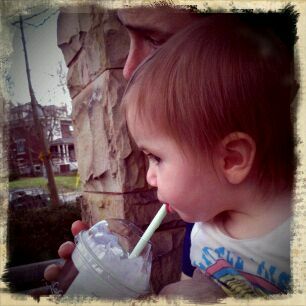 Josie, always one to have things 'just so' insisted that we save our shakes to drink on the porch. That's what we did last year, so it had to be repeated again the same way. 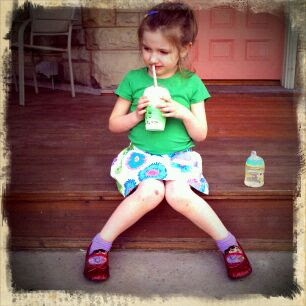 We also let Beatrice in on some Shamrock Shake action - and all cracked up about how enthusiastically she drank it! Since it was pushing 80 degrees, Lou took the girls for a walk. 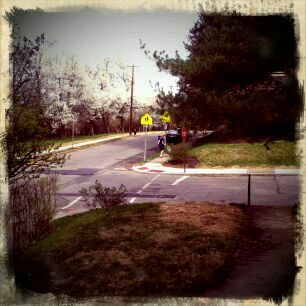 I caught them just as the crossed the street - Bea in the backpack, Josie holding Lou's hand. All in all, it was a really fun & silly St. Patrick's Day. My favorite part about it however, didn't happen until today. As I was putting away the girls' scarves and hats from a basket in our 'mud room' area, I found two beaters from our mixer!! 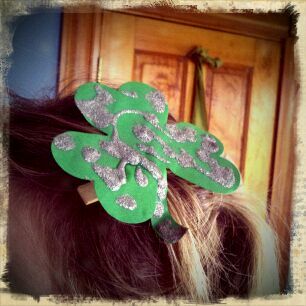 Josie, giggling like crazy, looks at me at says: "Oh that PESKY leprechaun!"